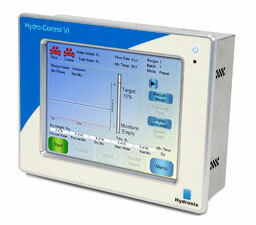 The Hydro-Control VI is a multiple language, touch screen, water control system from Hydronix. It is typically used in the concrete industry to provide an easy method for controlling the mix cycle to ensure that the correct amount of water is automatically added in the shortest possible mixing time. With a choice of water addition modes the Hydro-Control VI is the most versatile stand alone moisture control system available. The Hydro-Control VI is a stand alone unit that can be connected to a control system to easily enable the transfer of mix cycle information. With features such as automatic recipe selection and a colour touch screen display, the unit is designed for simplicity of use and integration into new or existing control systems. Using the reading from a Hydro-Mix or Hydro-Probe Orbiter sensor installed inside a mixer, the unit accurately and continuously monitors, displays and adjusts the moisture levels of the material throughout the mix cycle. Using known recipes, the Hydro-Control VI automatically calculates and adds the correct amount of water to the mix. This ensures that the required moisture target can be easily achieved, batch after batch. For customers that have a Hydro-Control V system, this unit has been designed as a direct replacement and provides an easy upgrade path with minimum disruption to production.